Lapidus is not a name I’d ever really heard of before now. This fragrance was launched in 1987, so is definitely in the classic/retro category, but I wanted to know a bit more about the house behind it. As it turns out, Ted Lapidus was kind of a big deal back in the day! Credited alongside Yves Saint Laurent with popularising the Safari jacket, Lapidus is also known for bringing military wear to mainstream fashion. He was the first to add epaulettes to both men and women’s clothing, as well as introducing blue jeans to the masses. On top of that, Lapidus pioneered unisex fashion, and even persuaded Twiggy to wear a suit and tie, rather than a mini skirt. His designs were worn by other notable figures, such as Brigitte Bardot Roger Moore and most famously, John Lennon on the cover of the Abbey Road album. Lapidus was also title sponsor of the AGS Formula 1 team in 1990, although they didn’t ever win any races, so their screen time would have been minimal. Lapidus fragrances were originally launched in 1970 in conjunction with L’Oreal. They were licenced by Jacque Bogart in 1983 before the Bogart Group acquires the entire Lapidus brand in 1998, shortly before selling Balenciaga. 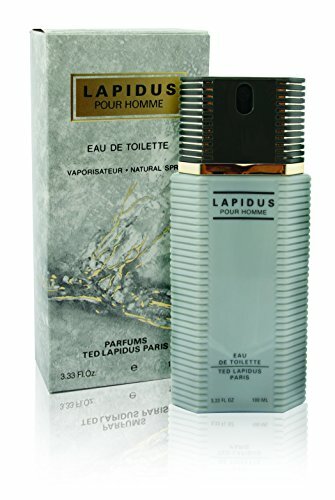 As I mentioned earlier, Lapidus Pour Homme was released in 1987, and has since been reformulated. It’s considered by many to be an ‘80’s Powerhouse’ fragrance that is rather marmite, with as many people hating is as loving it. This blind buy may have been a mistake! The presentation of Lapidus is beautifully retro. The box is a marble effect with a kind of ocean wave element, spot varnished in gold. There is more gold with the fragrance logo at the top. The typography is pure 80’s and I love it. The bottle is super 80’s with opaque grey glass, flanked on either side by ribbing that continues into the large plastic cap/sprayer. The logo is stamped on in black. Mine is off centre, but it kind of adds to the vintage feel of the whole presentation. The spray button has the TL logo embossed into the top which is nice. I’m not really a fan of how these big plastic spray caps feel, but they’re so of that era that I’m prepared to forgive Lapidus on this occasion. The first time I sprayed Lapidus Pour Homme, I found it to be very strong, and somewhat off putting in its opening. I’ve since changed my opinion. It starts off with a kind of floral, washing powdery freshness. As it begins to dry down, I start getting more of the woods coming through, but they’re a much more musty kind of woody smell compared to what I’m used to. That’s not to say it’s bad, it’s just different. I get hints of lemon, but mostly it’s initially an old fashioned soapy barbershop kind of scent. It’s once this has dried down completely that I really enjoy Lapidus. It becomes a much sweeter fragrance, with the honey and Tonka bean notes mixing with the woods and incense to create an intriguing masculine fragrance that is different to anything else I own. I do get slight hints of tobacco, or at least occasionally I’m reminded of being at school as a kid when we kept crayons in old tobacco tins. I’m really glad I bought this fragrance, although I’m not sure I’ll wear it all that often. For the money, it’s worth grabbing for the collection, and I definitely will wear it from time to time. It’s a unique fragrance that you should probably avoid if you’re under 30, but it’s an intriguing scent that will definitely make people notice you. Performance is awesome. I sprayed it on in the morning and was still getting occasional whiffs of it in the late afternoon. For me, this is one for the cooler weather. I wouldn’t want to wear this in the blistering heat as then I prefer much lighter fragrances. I’d be interested to know what your thoughts on Lapidus are. This is easily a love it or hate it fragrance. Let me know in the comments below! Base Notes: Sandalwood, Tonka bean, Amber, Patchouli, Musk, Oakmoss, Cedar and Tobacco.